Hey MBA readers! I’m still on a little blog break, but today I have a very special guest post lined up for you. 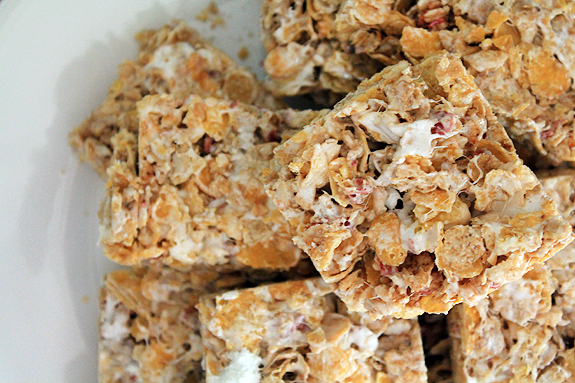 Amber’s here from Bluebonnets & Brownies with a fresh, Spring spin on Marshmallow Squares. Amber is one my best friends – she’s creative, hilarious, and one hell of a baker and cook – I’m incredibly honored to have her here today. Hi Y’all! Amber from Bluebonnets & Brownies here. Jamie’s been torturing me for a week with her photos of St. Lucia, but I sure am glad she got to relax for a bit. No one I know works harder at this whole blogging thing than her. When Jamie asked me to guest post and I mentioned making these squares, I kinda felt like that mom. I’ve not done any crazy hard work here, y’all. The most creative thing that happened was me viewing the cereal aisle at the grocery store the same way Jamie views the candy aisle: full of possibility. When I spotted the new Honey Bunches of Oats cereals from Post, I was pretty excited. Raspberry and Peach happen to be two of my favorite flavors, and together they are magical! You can also get a Blueberry and Banana combination, but I ignored that all together because I’m of the opinion that blueberries are from the devil. However, if blueberries are your thing, I’m pretty sure swapping it in for the raspberry peach cereal would float your boat too. Did you ever wonder how Starbucks gets those big chunks of marshmallows in their krispie squares? I certainly did. So when I went to make these for you, I decided to experiment a little. First I was going to add the little marshmallows at the last second before adding the cereal, hoping they wouldn’t melt entirely. Then it hit me – mixing them in with the cereal first was the way to go. It worked perfectly. The cereal tempers the already melted marshmallows just enough for them not to melt the baby marshmallows entirely. They get just gooey enough to be sticky, but retain their shape. So as you bite through the Raspberry Peach Marshmallow Squares, you’ll get bigger bites of gooey marshmallow goodness. You’re welcome! Raspberry and Peach are perfect Springtime flavors, and these squares are a great after-school treat, for you AND the kids. I hope you love them! 1. Spray a 9 x 13 metal or glass baking pan with cooking spray and set aside. 2. In a large soup pan or French oven, melt butter on low heat. 3. While butter melts in the pan, combine entire contents of cereal box and 1/2 a bag of mini marshmallows together in a large bowl. Toss with your hands until the mini marshmallows are well distributed. 4. When the butter has completely melted, add the entire bag of large marshmallows to the pan. Spray a wooden spoon with cooking spray and then use it to stir the marshmallows occasionally until they are all completely melted. 5. When all the marshmallows have melted into a smooth cream in the pan, remove it from the heat. Spray the wooden spoon with cooking spray again. Dump the contents of the bowl into the marshmallow cream, then stir stir stir with the wooden spoon until all the cereal has a nice coating of marshmallow and has begun to stick together. 6. 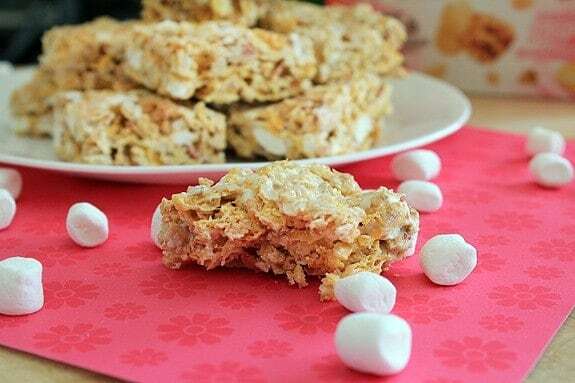 Spoon the cereal-marshmallow mix into the sprayed baking pan. Spray your wooden spoon again and use it to press the cereal firmly down into the corners of the pan and to flatten the surface. When the cereal is in a fairly even layer, refrigerate the pan. 7. Allow the treats to cool for at least 30 minutes to an hour. When they appear firm and crisp, remove the pan to a counter top. Flip the pan over and tap it a few times until the entire pan of cereal pops out in one large piece. 8. Turn the block of cereal over, then use a sharp knife to cut the block into squares, roughly 6 vertical cuts, then each strip into 4 squares, for 24 roughly even squares. - Keep in an airtight container. A ziptop bag is appropriate. - These treats keep best and longest if refrigerated, but it is not necessary. Love how easy these are!! So great for a quick snack. Love these flavors, so fun! Very Springy! They made me so happy. Ha, I too always wondered how starbucks go the chuncks of marshmallows in there rice krispie squares. What a great recipe!! Thanks, Jennifer! I don’t know where that flash of brilliance came from, I’d been thinking about it forever. I’m just glad it worked and I could share it. What a fun and NEW treat! I would love to give these a whirl for my next office party or get together. I think they’d definitely go down well at a party like that, Kristen. People love marshmallow squares anyway, and then you present them with flavors they don’t expect – it’ll make you the talk of the party! I’m trying to send the Raspberry Peach Marshmallow Bites to my email address but it won’t let it go through, could you please do it from your end? It would be greatly appreciated. Thanks for stopping by! Are you trying to send the post, the link or the RSS feed? Thanks. Huh – so you think blueberries are the devil and I think bananas are the devil. That cereal doesn’t stand a chance, does it? “full of possibility” <– I totally love that and couldn't agree more! Great job with these squares. They sound delish. Thanks so much! What other cereals do you think you’d turn into marshmallow squares? These look great! Love seeing your “face” here, Amber! Thanks, Rachel! I keep meaning to tell you I love the new blog name, by the way. I think it suits you more. Love that idea for getting big chunks of marshmallow in it! Beautiful! I’m already having ideas for variations on this theme. Jen, I’d love to see what sort of marshmallow squares you come up with. Love these! 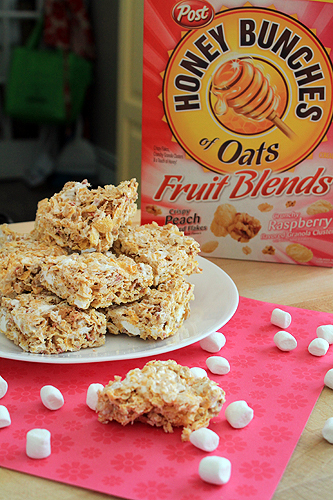 I totally love Honey Bunches of Oats, so I am all over them! It’s one of James’s favorite cereals too, Tracy. Oh, the marshmallow bits! I’m in love! I made these last night and brought them to school today! All of my friends absolutely adored them and kept coming back for more even though they claimed they were on “the prom diet”. 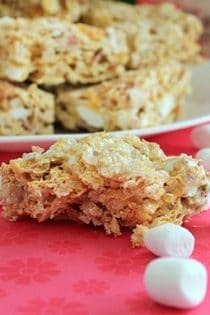 Thank you for sharing such a wonderful, delicious alternative to Rice Krispie treats! Emily, thank you so much for coming back to say so! I’m glad everyone loved them. And hey, of treats, marshmallow ones are usually pretty diet friendly. They average about 100 calories a square, with hardly any fat. Great recipe and the flavors are so good! It’s a nice change from regular rice krispy bars.